Frying is a cooking method found in almost every cuisine around the world; meat, poultry and fish are among the most commonly fried food. Among the gazillions of fried food dishes, fried chicken is one of the top favorites. The seasonings (and dipping sauces, if any) vary from culture to culture but one thing stays the same -- fried chicken is crisp on the outside but moist on the inside. Loved by children and adults alike, fried chicken is comfort food -- familiar and uncomplicated, and eating it (with the hands, of course!) requires no fancy tools. When Vietnamese chicken wings found its way to the Western hemisphere, the frying part became optional. Grilling, broiling or cooking in the oven became the preferred cooking methods. If I have to guess, it's due partly to the health belief that fried food -- especially deep fried meat -- should be avoided to reduce cholesterol buildup and clogged arteries that can lead to heart problems. Well, one can always continue believing what one has been raised to believe, or one can pay attention to recent admissions that a lot of medical literature from the last 50 to 60 years were borne out of doctors' ambitions and collusion with / bribery from drug companies. 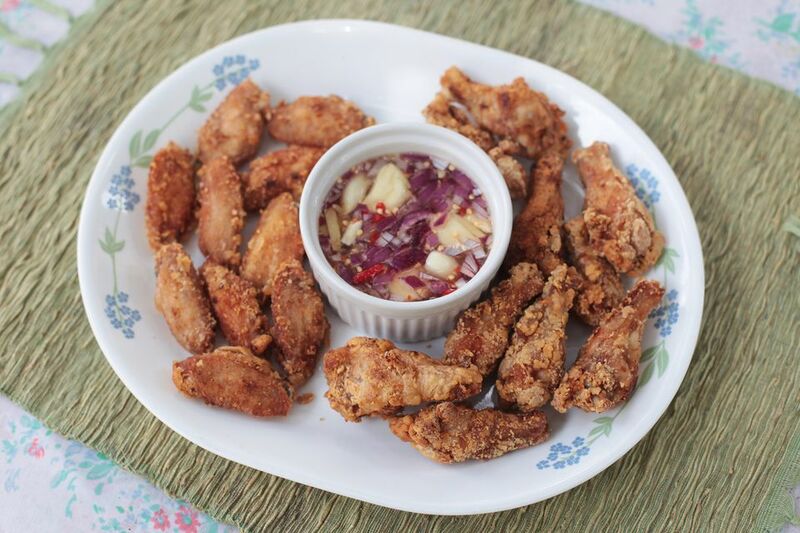 So, I cook my Vietnamese chicken wings Pok Pok style -- floured and deep-fried. The marinade I used, however, is not the same as Pok Pok's. Wipe the chicken wings. Cut through the joints so that each wing becomes three pieces. Discard the wing tips (or set side for making broth). Prepare the marinade. Using a mortar and pestle or mini food processor, grind the lemongrass stalks, garlic, chilies and ginger to a paste. Mix the spice paste with the fish sauce, lime juice and sugar. Place the chicken in shallow container. Pour in the marinade. Mix well, working the marinade into the meat. Cover and leave to allow the meat the absorb the flavors for about half an hour. Heat a wok or frying pan and pour in enough cooking oil to a depth of two inches. Drain the chicken wings. Place in a clean bowl, add the starch and toss coat lightly (a resealable bag will do well too). When the oil is hot (350F if you're using a thermometer; otherwise, wait for fine wisps of smoke to appear), deep fry the chicken in two batches. Cook all the little drumsticks (drumettes) together. When the undersides are golden brown and crisp (about three to four minutes), flip them over and cook the opposite side for about two to three minutes. Scoop out and drain move to a strainer. Cook the remaining pieces. Because the meat is not as thick, the second batch require a shorter cooking time. Scoop them out and move to the strainer. Half fill a small bowl with nuoc mam pha and place at the center of the serving platter. Arrange the chicken drumettes on one side and the rest on the other side. Serve at once. Mix Mekhong Into the "Thai Welcome Drink"